I have a feeling Holly Hunter’s character in the 1995 movie Home For the Holidays is not alone in this sentiment. I was drawn to this movie when it came out and, once I saw it, I watched it again and again. Holly Hunter plays Claudia Larson, a thirty-something, recently fired, single mom who is flying home to visit her family for Thanksgiving. When she arrives in her hometown, the rest of the family are introduced: her over-mothering mom who tries to ensure everyone gets along while chain-smoking to handle the stress of this task; her father who says whatever is on his mind and videotapes the family drama for future generations to enjoy; her perfectionist sister who strives to create the beautiful family holiday we’ve all dreamed of; and her practical-joking brother who doesn’t know when a joke is no longer funny and surprises his family by bringing home his new boyfriend. While the movie is a comedy, it’s a drama as well. If you’ve ever experienced any family holiday drama, some of these scenes will hit close to home. You will find yourself laughing, crying, or doing both. There’s a great review of the film written by Roger Ebert which you can find at www.rogerebert.com/reviews/home-for-the-holidays-1995. I’ve wondered why I have been so drawn to this movie since I first saw it in the mid-nineties. The Larson family is a mess! But I think there is comfort in seeing that we are not alone in our dysfunction. 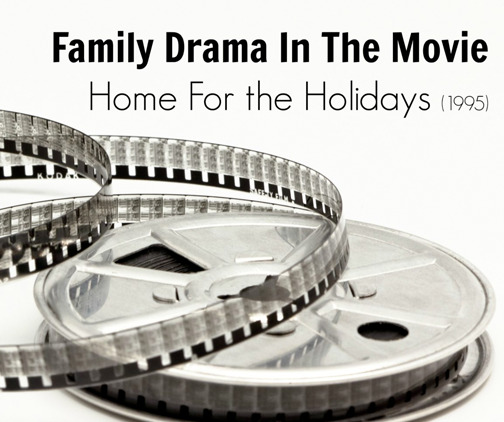 Sometimes the happy-ending family movies shown during the holiday season only make us feel like we are alone in our own family drama. Watching another family act out on their misunderstandings, old resentments, and hidden agendas helps us see that what we experience with our families is not so unlike what other families experience. Most, in fact, are probably not quite as messed up as the Larson family. And for that reason, watching this movie is a gift, not just for us, but for our extended family as well.